These kind of Bungalow are typical Philippine style nipa-huts, European style, tiled bathroom with many amenities including cold showers. 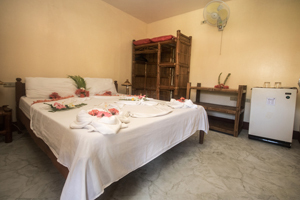 The bed, living room, closet and table are all made of bamboo and rattan. The interior has the ambience of modern living, while the exterior blends in well with the tropics and nature. The exterior wall finish and the railing of the veranda are made of bamboo and sawali (a local material similar to bamboo). The room has a electric fan and a fridge to cool your drinks.